Mickey Harte's 2005 All Stars ran out victors in today's Vodafone GAA All Stars exhibition match in Dubai, as they beat the 2006 team 4-13 to 3-10. 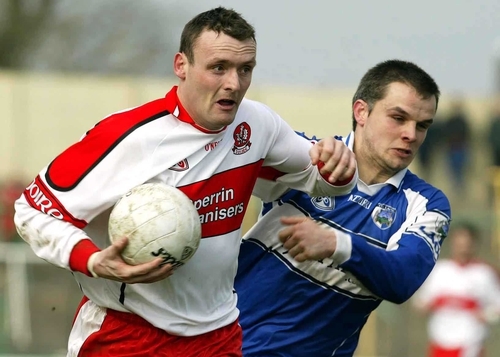 Derry attacker Paddy Bradley led the scoring for the 2005 selection, notching 2-05, while Tyrone's Sean Cavanagh hit the net twice in the second half. The sides were level at 1-07 apiece at the break – retired Kerry star Seamus Moynihan, who captained last year's All-Stars, showed his old spark to race up and beat Paul Hearty with a measured goal finish. The 2006 side, managed by Kerry's All-Ireland winning boss Jack O'Connor, had points in the first half from Nicholas Murphy, Sean O'Sullivan, Ross Munnelly, Alan Dillon and James Masters. But Harte's outfit took over after the resumption in temperatures touching the mid-20s. 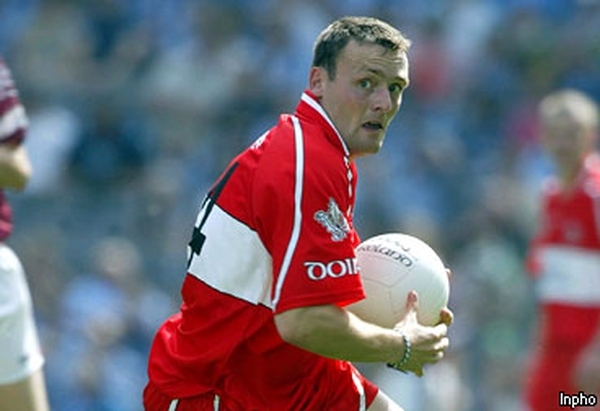 The energetic Cavanagh found Alan Quirke's net on two occasions before Masters and Dublin's Alan Brogan replied with green flags at the other end. Bradley's second goal, allied to a smattering of points which included an inspiring long range shot from Armagh goalkeeper Hearty, saw the 2005 side canter out to a six-point win. The day began on a sombre note for Dublin defender Shane Ryan, who lined out at left half-back on the 2006 team. His paternal grandfather, Seamus O'Riain, who was GAA President from 1967 to 1970, died in the early hours of the morning. A minute’s silence was held in his honour before throw-in in Dubai. Vodafone GAA Football All Stars 2005: Paul Hearty (Armagh); Ryan McMenamin (Tyrone), Michael McCarthy (Kerry), Andy Mallon (Armagh); Graham Canty (Cork), Conor Gormley (Tyrone), Aaron Kernan (Armagh); Paul McGrane (Armagh), Sean Cavanagh (Tyrone); Brian Dooher (Tyrone), Peter Canavan (Tyrone) (capt), Owen Mulligan (Tyrone); Paddy Bradley (Derry), Stephen O'Neill (Tyrone), Steven McDonnell (Armagh). Vodafone GAA Football All Stars 2006: Alan Quirke (Cork); Barry Owens (Fermanagh), Karl Lacey (Donegal), Seamus Moynihan (Kerry) (capt); Ger Spillane (Cork), Aidan O'Mahony (Kerry), Shane Ryan (Dublin); Nicholas Murphy (Cork), Sean O'Sullivan (Kerry); Alan Brogan (Dublin), Alan Dillon (Mayo), Conor Mortimer (Mayo); James Masters (Cork), Ross Munnelly (Laois), Brian Kavanagh (Longford).